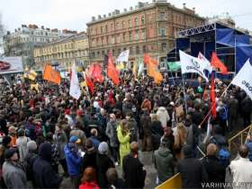 More than seven thousand people turned out in St. Petersburg on Sunday to protest alleged falsified election results, with participants stemming from opposition movements, nationalist groups, human rights advocates and ordinary Russian citizens, Kasparov.ru reports. Along with Kurnosova, Oksana Dmitrieva from A Just Russia and leading opposition politician Boris Nemtsov made speeches at the rally. While the protest had been sanctioned by city authorities, witnesses reported that around ten armored military trucks were seen making their way towards the center of the city on Sunday morning. In addition, police briefly detained Nemtsov at the Moskovsky train station and demanded an explanation for his trip to the city. According to Grani.ru, the police presented Nemtsov with a document labeling him as a “leader of extremists.” The opposition leader was released after explaining that he had come to participate in a sanctioned rally. The incident compacted Nemtsov’s fears that he is being watched. “The police continue to follow me earnestly, and I suspect that my freedom could soon come to an end,” he said. Accusations of “extremist” activity are commonly used by Russian government authorities to persecute or marginalize opposition politicians. Also on Sunday, the Russian Central Electoral Commission rejected an application by fellow opposition leader Eduard Limonov to run for president. The commission stated that the rejection was based on a lack of minutes from a meeting that is required by law to be held in support of the candidate. Limonov denounced the decision as politically motivated and promised to challenge it in court. On December 15, the oppositionist found himself without a physical place to hold the meeting, since the hall he had rented was abruptly closed for “urgent repairs” the day of the meeting.